Frack Free Wrexham, after receiving the response from the government to the Freedom of Information request are delighted to confirm that fracking in Borras and Holt area will not take place in the near future. This means that the threat of fracking has not gone away, Borras and Holt is still at risk from fracking, however if the threat of fracking does return, we will be back. The Borras and Holt Community Protection Camp was set up with the permission of the land owner, adjacent to the fracking site. The landowner, Frack Free Wrexham, the locals and the camp have worked together against the threat of fracking and we have succeeded for now, a huge achievement. Therefore the camp will be closed. We will ensure the field is returned to its original condition. 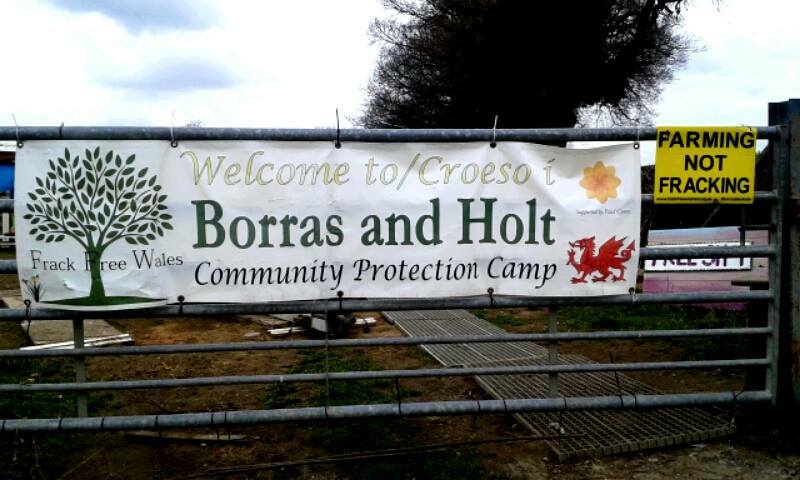 The Borras and Holt Community Protection Camp was established by the local anti-fracking movement in November 2014 and has received a huge amount of support from the wider local community. During that time many, many dedicated people have been residents of the camp ensuring a continuous community presence against the threat of fracking. Hundreds of individuals have laid sheer emotions and energy into protecting this land from the fracking industry. We have laughed, cried, danced and sang together. People from all walks of life came together in unity to make a stand against an industry that threatened the very foundations of Borras and Holt. A great welcoming community with warm, caring and inspirational people, who have played a massive part in stopping the threat of the fracking drill. The united efforts between the locals and the anti-fracking movement has stopped the drill for now and will stop it again, if the industry does come back to Borras and Holt. Keep an eye on our facebook page for updates. We would like to thank the local people for the huge amount of support the camp has received from the Wrexham area and much further afield, without that support the camp and the local campaign would not be able to celebrate this achievement. We would also like to thank any organisation or individual who has supported the camp in any way. We sincerely thank you all. Together united we have defeated the fracking industry for now. iGas we will be watching.